DCC-2618 is an orally bioavailable switch pocket control inhibitor of wild-type and mutated forms of the tumor-associated antigens (TAA) mast/stem cell factor receptor (SCFR) KIT and PDGFR-alpha, with IC50 values of 4 nM, 8 nM, 18 nM, 5 nM and 14 nM for WT KIT, V654A KIT, T670I KIT, D816H KIT and D816V KIT, respectively. 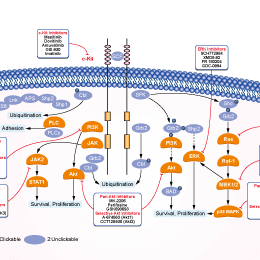 PDGFR inhibitor 1 is an orally bioavailable switch pocket control inhibitor of wild-type and mutated forms of KIT and PDGFR with potential antineoplastic activity. It also inhibits several other kinases, including VEGFR2, TIE2, PDGFR-beta and CSF1R, thereby further inhibiting tumor cell growth. H&E stained histology slides of A), C), and E) control implants and B), D), and F) drug-loaded implants for 14, 21 and 28 day time points respectively. Location of the implants is denoted by the asterisk ‘*’. Scale bar: 200 μm. Avapritinib (BLU-285) is a small molecule kinase inhibitor that potently inhibits PDGFRα D842V mutant activity in vitro (IC50 = 0.5 nM) and PDGFRα D842V autophosphorylation in the cellular setting (IC50 = 30 nM); also a potent inhibitor of the analogous KIT mutation, D816V in KIT Exon 17 (IC50 = 0.5 nM).